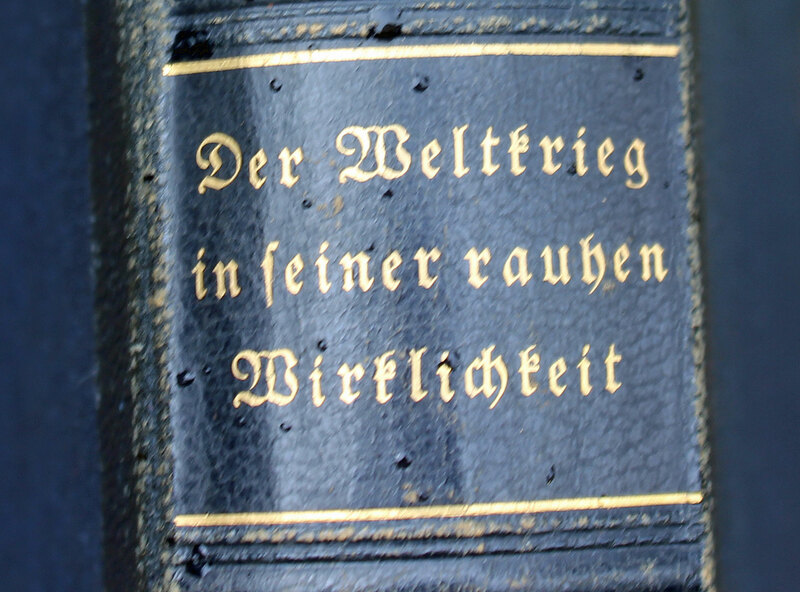 Looking through a box in der German house (day 23 since I moved) I came across this first edition book – ‘Der Weltkrieg In Seiner Rauhen Wirklichkeit’ or ‘The World War In Its Harsh Reality’ published in Germany in 1926. The book contains 600 black and white photographs taken by Hermann Rex for the German military command during 1914-19. It’s tough going to read as the true horror of war is documented with seemingly endless corpses and obliterated villages etc..
My thoughts 100 years on is that ‘Der Weltkrieg In Seiner Rauhen Wirklichkeit’ does indeed show the harsh reality of war, but it failed to nail the reasons for the war or take to task the aristocratic, military and industrial complex that led Germany to war, who then fought it with lies and offered no real strategic plan to win it, battles yes, but not the war itself. Rather the book says that it hoped in 1926 to honour the ordinary soldier (a reaction to who was to blame). The failure to grasp and hold responsible the Prussian idiotic mind-set backed by the aristocratic, military and industrial complex was a fatal mistake of German society as it undermined the fledgling democratic Weimar Republic and then pushed Hitler into power. Nonetheless it is an amazingly sobering book! Pictures: English dead on the Kemmelberg (a spot well known to cyclists) and a town destroyed in France.